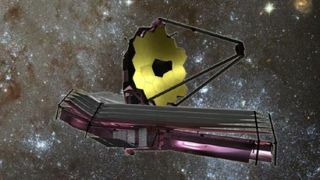 JWST will study every phase in the history of our Universe, from the first luminous glows after the Big Bang, to the formation of solar systems capable of supporting life on planets like Earth. WASHINGTON — The House appropriations panel that oversees NASA unveiled a 2012 spending bill July 6 that would pull the plug on the budget-busting James Webb Space Telescope as part of a broader $1.6 billion cut that would roll back spending on the nation’s civil space program to pre-2008 levels. The $16.8 billion top-line figure, released July 6 in draft legislation from the House Appropriations commerce, justice, science subcommittee, is nearly $2 billion less than U.S. President Barack Obama’s 2012 budget request for NASA. The draft appropriations bill, which the subcommittee is scheduled to vote on July 7, also includes $1.95 billion for the Space Launch System — the heavy-lift rocket Congress ordered NASA to build for deep space exploration. The proposed 2012 funding level is $150 million more than the heavy lifter got for 2011, but some $700 million below the amount recommended in the NASA Authorization Act of 2010, which became law in October. One of the proposed bill's features is the cancellation of NASA's over-budget James Webb Space Telescope, an ambitious $6.5 billion infrared observatory designed to peer deeper into the universe that the iconic Hubble Space Telescope. The bill also would provide $812 million for the Joint Polar Satellite System, or JPSS, being developed by the National Oceanic and Atmospheric Administration (NOAA). That amount would be an increase of $430 million from the amount appropriated for the program in 2011 but $258 million less than the agency requested. In total, NOAA would receive $4.49 billion next year, $103 million less than was appropriated for 2011 and $1 billion less than the administration’s request for 2012. SPACE.com Staff contributed to this report.Visit SPACE.com for complete coverage of NASA's final space shuttle mission or follow us @Spacedotcom and Facebook.